The following cases were heard under the Aroostook Criminal Docket at the Houlton courthouse during the month of December 2018. 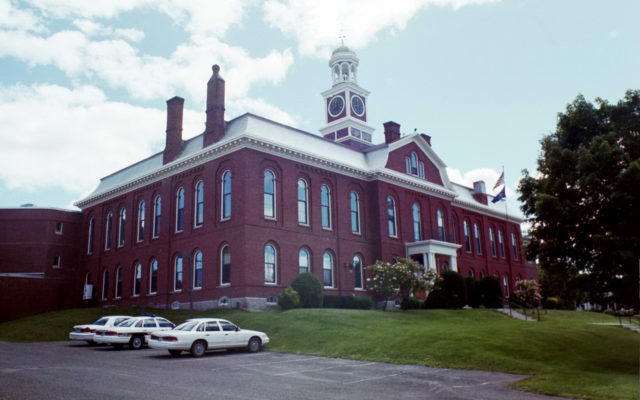 HOULTON, Maine — The following cases were heard under the Aroostook Criminal Docket at the Houlton courthouse during the month of December 2018. Leslie G. Fanjoy, 33, Houlton: probation violation, five days in jail, probation partially revoked, probation continued. Darrin N. Cobb, 32, Houlton: criminal conspiracy, dismissed; unlawful possession of scheduled drug, $1,000 fine. Austin McAfee, 20, Bangor: burglary, dismissed; theft by unauthorized taking or transfer, 35 days in jail; criminal mischief, 35 days in jail; criminal trespass, 35 days in jail. Chad McMannus, 35, Merrill: criminal threatening, $300 fine, 180 days in jail all but three days suspended, one year probation. Gunnar A. Briggs, 21, Orient: probation violation, 30 days in jail, probation partially revoked. Jesse E. Sawyer Sr., 37, Linneus: operating after habitual offender revocation, $500 fine, 90 days in jail. Daniel Nason, 27, Houlton: domestic violence assault, 364 days in prison all suspended, one year probation; domestic violence criminal threatening, dismissed; criminal threatening, $400 fine. Dustin Haney, 30, Houlton: probation violation, six days in jail, probation revoked. Trevor A. Beaton, 24, Houlton: motor vehicle speeding: 30-plus mph over speed limit, $300 fine. John C. Henderson, 60, Bridgewater: possessing sexually explicit material of minor under 12, 30 months in prison all but 60 days suspended, six years probation; possessing sexually explicit material of minor under 12, 60 days in jail. Jesse E. Sawyer, Sr., 37, Linneus: burglary, 90 days in prison, two years probation, $12,699.29 restitution; theft by unauthorized taking or transfer, eight years in prison all but 90 days suspended, two years probation, $12,699.29 restitution. Joshua Hartley, 34, Canaan: operating after habitual offender revocation, prior, $1,000 fine, six months in jail; violating condition of release, 10 days in jail. Matthew R. Flewelling, 30, Bridgewater: operating after habitual offender revocation, two priors, $1,000 fine, nine months and one day in prison; operating after habitual offender revocation, two priors, $1,000 fine, nine months and one day in prison; failure to give correct name, address or date of birth, dismissed. Leslie Fanjoy, 33, Houlton: possession of hypodermic apparatuses, $400 fine, five days in jail. Tonya Dickinson, 31, Merrill: unlawful possession of methamphetamine, priors, $400 fine, 18 months in prison all but 90 days suspended, two years probation, $120 restitution; operating under the influence (drugs or combo), $500 fine, 48 hours in jail, 150-day license suspension. Eric S. Tweedie, 55, Houlton: domestic violence assault, priors, dismissed; disorderly conduct, offensive words, gestures, 30 days in jail; criminal threatening, 30 days in jail; domestic violence assault, 364 days in prison all but 60 days suspended, two years probation. Salvatore J. Valiante, 38, Linneus: domestic violence assault, 10 days in jail. Eric Frank, 60, New Limerick: criminal threatening with a dangerous weapon, dismissed. Jessie A. Case, 33, Mars Hill: operating after habitual offender revocation, prior, $1,000 fine, six months in jail. Tony A. Smith, 50, Houlton: criminal threatening with a dangerous weapon, dismissed. Micah G. Lawlor, 43, Merrill: violating condition of release, 30 days in jail. Danielle L. Howe, 35, Houlton: violating condition of release, dismissed. Tonya Dickinson, 31, Oakfield: unlawful possession methamphetamine, priors, $400 fine, 90 days in jail; violating condition of release, 30 days in jail. Cassandra Secord, 28, Houlton: unlawful possession of scheduled drug, $400 fine. David J. Raymond Sr., 63, Patten: unlawful possession of scheduled drug, $400, 48 hours in jail. Travis Fitzpatrick, 36, Hammond Twp: criminal trespass, dismissed. Danielle L. Howe, 35, Houlton: violating condition of release, $100 fine. Stephen W. McMann, 51, Houlton: domestic violence assault, dismissed; unlawful possession of methamphetamine, $400 fine, two years in prison all but 90 days suspended, two years probation; violating condition of release, 30 days in jail. Jennah N. Blake, 20, Ludlow: shooting from motor vehicle-NSD, $200 fine. Christina Ann Donnelly, 43, Littleton: failure to register vehicle, $100 fine. Danika L. Brown, 25, Hodgdon: operating while license suspended or revoked, $250 fine. Corey B. Corbett, 40, Haynesville: attaching false plates, $100 fine; failure to register vehicle, $100 fine. Rebecca Robinson, 22, Houlton: attaching false plates, $100 fine. Diane R. Fiske, 65, Medway: shooting from motor vehicle, $200 fine. Leonard A. Hills Jr., 19, Winthrop: operating while license suspended or revoked, $250 fine; attaching false plates, $150 fine. Brad T. Suitter, 26, Linneus: failure to register vehicle, $100 fine. Everett M. Lyons, 57, Lincoln: unlawful possession of wild animal or bird, $500 fine. Phillip A. Branscombe Jr., 55, Oakfield: burning without a permit, $100 fine. Ricky A. Haines, 58, Monticello: failure to produce vehicle or return it to scene, $250 fine. Elaine L. MacKay, 42, Littleton: theft of lost or mislaid, or misdelivered property, de minimus; refusing to sign criminal summons, de minimus. Ezra J. Brady, 27, Houlton: operating while license suspended or revoked, prior, $500 fine. Stephen W. McMann, 51, Houtlon: violating condition of release, 48 hours in jail. Willard Putnam, 60, Houlton: violating condition of release, seven days in jail. Darielle McKee, 34, Houlton: operating a vehicle without a license, $250 fine. Rita E. Pritchard, 45, Cary: operating a vehicle without a license, $150 fine. Forrest N. Heath, 23, Presque Isle: operating while license suspended or revoked, $250 fine. Lori Brown, 44, Houlton: failure to register vehicle, $200 fine. Joshua R. DeVault, 36, Corinth: violating condition of release, $400 fine, seven days in jail; unlawful possession of scheduled drug, seven days in jail. Robert C. Wright lll, 36, Houlton: domestic violence assault, seven days in jail; violating condition of release, $250 fine. Jamie A. Kaelin, 40, Crystal: operating unregistered ATV, $200 fine. Travis Fitzpatrick, 36, Hammond Twp. : entering or causing a projectile to enter a place illegally, $200 fine.